Use Ivan's expertise to quickly attain your public speaking or organizational goals. Ivan has led sessions and worked individually with thousands to rediscover their passion and follow a path of joy in their lives and careers. 'Miracles' often happen around Ivan. Ivan has personally led award-winning public speaking sessions in addition to organizational turnarounds that leverage the 'new loyalty principles.' He brings about quick results through building trust, turning fear into productivity and dramatically improving communication in ways that inspire leaders and employees to ensure that audiences and customers go WOW! Ivan's book brings us inspiring examples from successful CEOs, Steve Young, parents, and employees throughout the country. 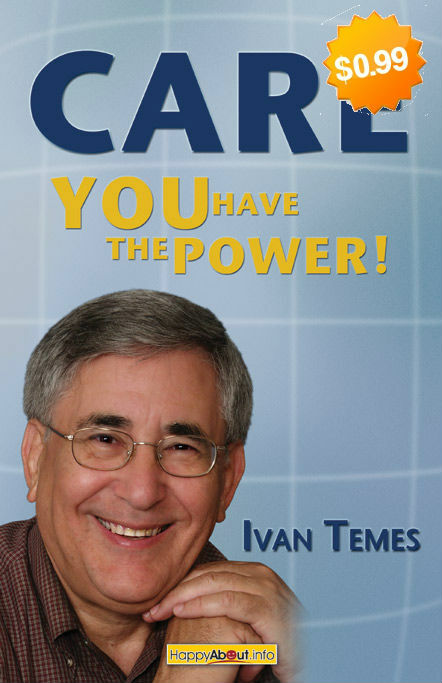 Obtain the eBook 'Care: You Have the Power' for only 99 cents (normally $14.99) and be inspired by the actions each of us can take immediately. Click HERE then select the eBook and enter the code 'care' at checkout for the 99¢ price. Subscribe today for complimentary care tips and receive a FREE copy of "The 11 Commandments of Care." Be part of a worldwide movement to spread daily stories of care that can positively impact millions of people. Ivan Temes is the founder of Leadership and Loyalty. He is former worldwide customer care director of companies including Levi's and Apple and is renowned for heart-driven public speaking in addition to building teams known for their exceptional service. He has now led hundreds of innovative sessions to assist participants (career centers, universities, shelters, veterans) in building their self-esteem and following their path of joy in life. He has personally led two organizational turnarounds and works with companies to build outstanding teams that focus on the customer.